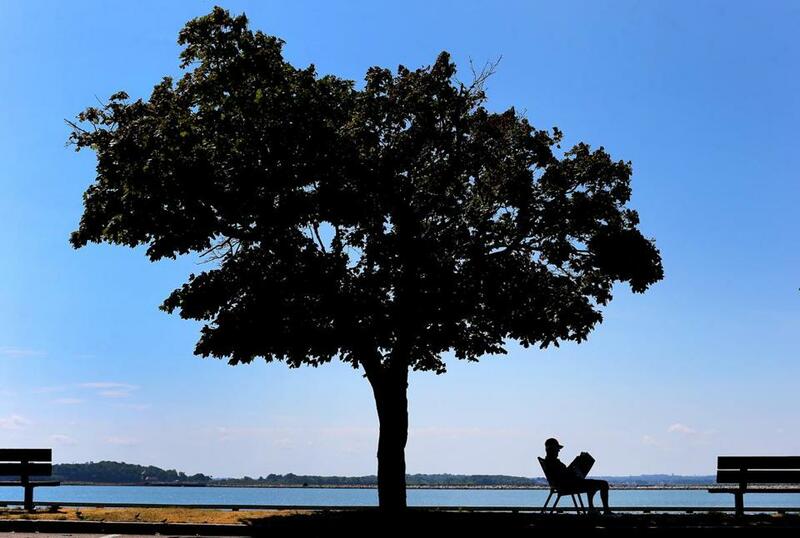 Boston’s tree shade is well below the national average for cities. The people who live here must step up. A man found a cool spot under a tree on the sidewalk of Day Boulevard in South Boston during the summer. When we moved to Charlestown 13 years ago, each spring our block transformed into a mini arboretum, the trees unfurling a park-like canopy. A crab apple tree filled one window of our second-story condo with fluttery white blooms. Then the winter of 2014 snapped one behemoth practically in two and mangled another. The drought of 2016 caused thirsty trees to start dying limb by limb. A moving truck dismembered an imposing elm across the street from us. Then another marauding truck ripped a large branch off the crab apple outside our window. Sunlight broke through the street’s once dense shade. When this spring came, the crab apple’s wound from the truck strike still gaped angrily. A green fungus began to mottle its trunk like a rash. Though April’s monsoons broke the state’s drought, only about a quarter of the crab apple’s branches leaved out. A sad handful of frail flowers opened briefly and then drifted to the ground like spent confetti. After wringing my hands at the state of “my’’ crab apple until August, I finally thought to call for help. Searching for a phone number online, I stumbled upon a Boston Parks and Recreation Department website that explained how I could nurture a street tree. I gulped. Me. Why hadn’t I thought of that? Turns out you get the urban forest you deserve. Cities can plant a national park’s worth of trees, but if no one tends to them don’t expect much of a canopy. Each street tree needs at least 10 gallons of water a week. Boston has about 38,000 trees. The parks department, which cares for public shade trees, has three arborists. Do the math. “We need all the help we can get,” says Greg Mosman, a Boston city arborist/tree warden. Little wonder that Boston has a paltry tree canopy, with only 28 percent of the city shaded by trees (including those in parks and on private property). That’s below the average American city’s 35 percent, let alone US leader Atlanta’s 65 percent. There’s a raft of studies demonstrating the magic of trees for cities. They soften the hard edges of our urban neighborhoods, filter air pollution, reduce runoff, and cool the summer heat. That’s why a collection of Boston groups in 2007 set an audacious goal of planting 100,000 trees by 2020. That effort has stalled, say Mosman and others, and they don’t have much to show for the trees they did plant. Like many US cities that tried to expand their canopies, Boston isn’t any greener, says Jon Kachmar, the Nature Conservancy’s urban program director in Massachusetts. Without citizen stewards, many of the saplings have died, typically of thirst. Meanwhile, Mosman guesses about 500 mature trees perish in Boston each year, and while the city planted 1,200 last year, and waters them when it can, it isn’t enough to make Boston greener. To break this cycle, Kachmar says, people have to essentially adopt trees. The Beacon Hill Civic Association’s Tree Committee encourages residents to do just that. The Tree Committee works with the city to replace dead trees in the neighborhood, and when new saplings are planted, it sends a letter to abutters requesting they look after the youngsters. This spring it hung big green cards on the newbies reading “I’m New and Thirsty” and asking people to water them. Those who do tend to be single-family homeowners, says John David Corey, the Tree Committee’s co-chair. Renters and condo owners like me have to lug water down flights of stairs. Building owners and associations could help by making ground-floor hoses available. We can all help give a street tree some TLC. All you need is a hose or water bucket, a bag of mulch, and a watchful eye. Young trees need a weekly dousing (10 to 20 gallons) until the ground freezes. But just cleaning and mulching a tree pit will help it thrive. Mulch retains rainwater and will make the tree look cared for, which Mosman believes discourages people from letting their dogs pee on it, burning the bark. Never prune a tree — call the city when you think a tree needs a haircut or looks sick. It’s too late for our crab apple, but the maple just up the block is looking peaked. I asked my neighbor if I could use his hose to give it a drink. This tree is not dying on my watch. Amy Sutherland, a best-selling author in Charlestown, writes the Globe’s Bibliophiles column. Send comments to magazine@globe.com.